A new toy! Ever since childhood we love the sensation of experiencing something for the first time, something new to try. As adults we tend to be more distanced, but for many of us tech gadgets become the new toys that create excitement. And what tech gadget is more fascinating than “the Internet”? To fully immerse oneself in the endless depths of the web is still, for many of us, a special experience! Who doesn’t like to look back on their very first computer, or first own car? These first encounters always and inevitably define the way we feel about things. And that is true, whether it is someone’s first Internet access in a new home or a modem has to be rewired after upgrading to new version. The users are in for a surprise once the package arrives from the service provider and countless devices – yeah, I am also counting all the Internet and WiFi capable “things” in the household – have to be powered up, wired, connected, and configured – maybe even without a technician, without help. “It’s simple, just plug it into the wall socket!” they keep saying. Beginners and less tech savvy users are alienated right away. Where does this odd plug go? What is a splitter and why do I need one? Why does the modem need an additional “activation”? What about this WLAN, and why is there no LAN cable for that? And this long complicated password, where do I enter it? As a result, the joy of something new quickly disappears and is replaced by the frustration to have to deal with countless technical issues. And all the user ever wanted to do was surf the Internet – carefree and untroubled. The disappointment and frustration are very noticeable when customers finally call their providers demanding support. 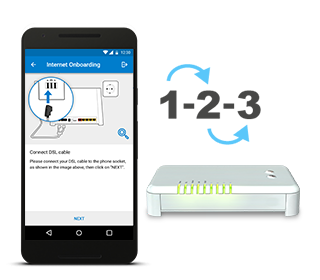 Customer onboarding has an important role to play at this crucial moment: it starts with unboxing everything, checking all customer credentials, and continues with cabling everything and ends with setting up an optimised WiFi connection and home network. All these steps, and many more, are covered by our self-care product for Internet & WiFi: m2suite mobile. We guide customers through the process and help them to explore their Internet access with ease. Self-Care for Internet & WiFi means to give customers the tools they need to set up their Internet connection, optimise WiFi and the home network and configure everything to their liking – on their own. Our mobile apps help them with daily topics such as the WiFi access for their guest or the connection of new devices. Users also learn to solve a lot of issues on their own without much effort. All in all, customers get what they wanted: straightforward, hassle-free Internet and WiFi, so they can enjoy their favourite technology. Next → Next post: We are looking forward to the BBWF 2018!